This is the standard Tie Down used by millions across the country. Hundreds of uses, but we are thinking mainly of m/cs and ATV’s. We only use the best Aviation Grade webbing and buckles which are the highest rated. * Use your Back Button to go back to the original website! 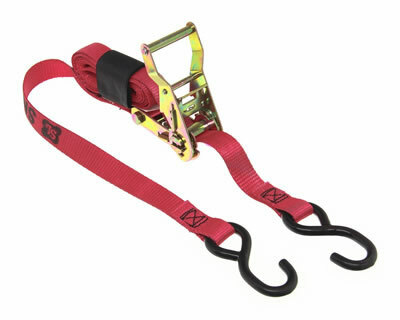 This is the standard Tie Down used by millions across the country, with an added Soft Hook system. Hundreds of uses, but we are thinking mainly of m/cs and ATV’s. We only use the best Aviation Grade webbing and buckles which are the highest rated. This is the standard Ratchet Tie Down used by millions across the country. Hundreds of uses, but we are thinking mainly of m/cs and ATV’s. We only use the best Aviation Grade webbing and buckles which are the highest rated. Securing motorcycles on a truck or trailer is much more difficult if the bike has a fairing or windscreen. The Bar Harness cleverly attaches to the handlebars and gives a 100% secure fixing using the wrap around covers over the grips. Ideal for all kinds of bikes, but indispensable for sport bikes. Use your tie downs to attach to your truck or trailer. Center section is covered in fleece to prevent rubbing, etc. Caution: Care should be taken when using ratchet tie downs. Caution: Custom bikes with high handlebars can also be secured with the Bar Harness, but great care should be taken to prevent bending the bars...Ratchet tie downs not recommended.